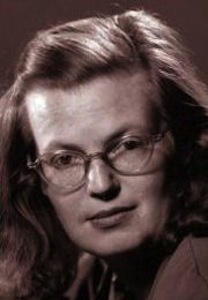 Shirley Jackson (Dec 14, 1916 - Aug 8, 1965) was an American author who gained fame - and notoriety - with her June 26, 1948 publication of The Lottery in The New Yorker Magazine. Many folks interpreted the story as an attack on the values of small town America and its publication was met with an avalanche of negative feedback including hate mail and canceled subscriptions. Without historical context, it's difficult for the modern reader to imagine that reaction. Back in the late 1940s, when The Lottery was published, many city councils in rural communities across America organized weekly cash-prize lotteries that would draw people together. The weekly events were meant to provide merchants with an opportunity for sales, but they were also an important socializing opportunity that provided far-flung neighbors a chance to get together, socialize, and share a sense of community. So the setting in Jackson's story -- which seems like a fictional artifact to modern readers -- was a very common and recognizable social activity that hundreds of thousands of Americans participated in when the story was first published. Given that knowledge, it's easy to understand why many folks interpreted the fictional work as a criticism -- even an outright attack -- on their way of life; many of them could see elements of their own town in the story and the connotations were strongly negative. Despite its reception at the time, the story has become accepted as a short story classic and is widely read in American classrooms today. Akin to cyberbullying, it remains a cautionary tale of the destructive powers of rumor and innuendo. “It isn't fair, it isn't right," Mrs. Hutchinson screamed, and then they were upon her."